What's the difference between selling furniture and software? Yup, you got it! Everyone knows what a couch is, and the most explaining you have to do is about the materials used or the style. However, for the most part, a couch is a couch — it speaks for itself. As for software..., well that is an entirely different story. Last year, I had an interesting conversation with one of my clients, Barry from Juriba — a software company that helps enterprises manage large IT Transformation projects and achieve Evergreen IT. When he finished, he wrapped up his explanation with something like: "Yeah, we are not Microsoft selling Windows, and everyone knows what it does. We always have much explaining to do!" I had an invested interest in understanding his product — however, most people checking our your website are not ready to listen to a 10-minute explanation. And believe it or not, the complexity of their products is one of the biggest marketing challenges IT companies and software providers face today. Getting people to your website is easy, but explaining what your product does in an easy-to-consume, but detailed enough fashion seems impossible. This is where Inbound Marketing can help! One of my favorite marketing mantras is the 1/4" drill. No one ever went to the hardware store and thought 'Today I am going to get myself a 1/4" drill.' No, they do not want to buy a drill; they need to make a hole! The moral of the story is: No matter what your product does, it always comes down to what is in it for me! How can I benefit from this? Basically, the benefits that a user gets from buying your software. The good news is that benefits are a lot simpler to explain! Take Juriba as an example! Their product comes with a lot of amazing features such as automated email communication, self-service capabilities, and a lot of other technical bells and whistles that are too many to list! But what it really boils down to is that Dashworks solves the core issue IT managers face when embarking on migrating tens of thousands of users to Windows 10 or Office 365. 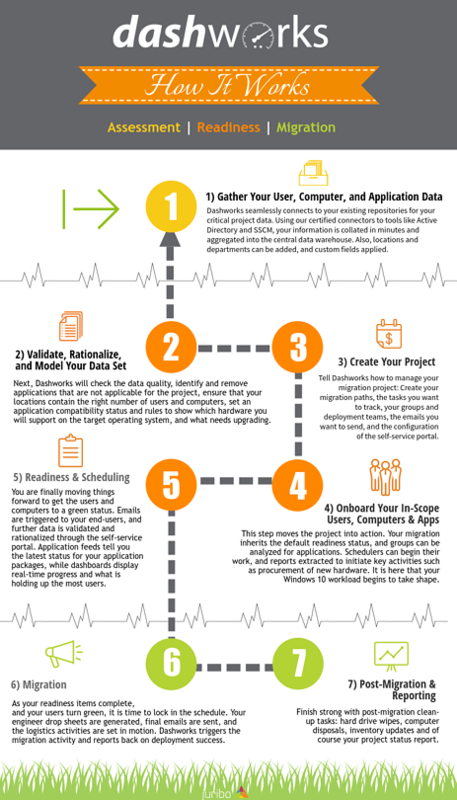 Instead of handing around dozens of out-of-date spreadsheets that quickly becomes an unmanageable disaster resulting in months of overtime and skyrocketing costs, Dashworks provides a central place to manage the entire migration project. Now, of course, this breaks down into other benefits: for example return on investment, saving in staff costs, better reporting to the business side, increased user engagement, and so on. Over the past few months, we have been tackling each of these benefits from different angles in blog posts. 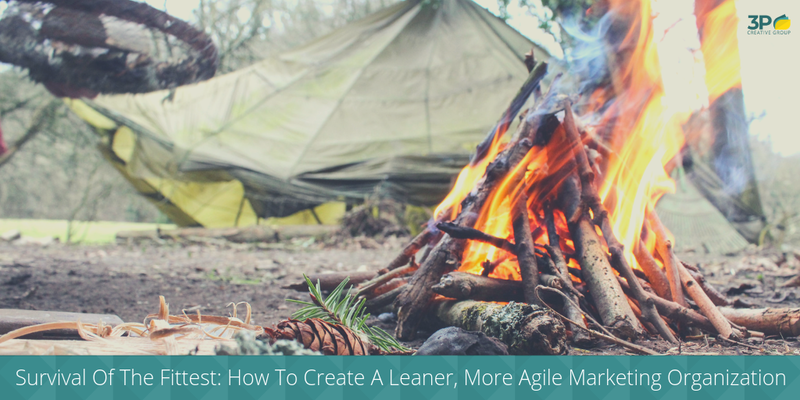 Now if a frustrated IT manager is looking for a solution that will help him accelerate his next project, he will find a blog post that clearly presents a solution to his problem — instead of listing a bunch of sophisticated features. 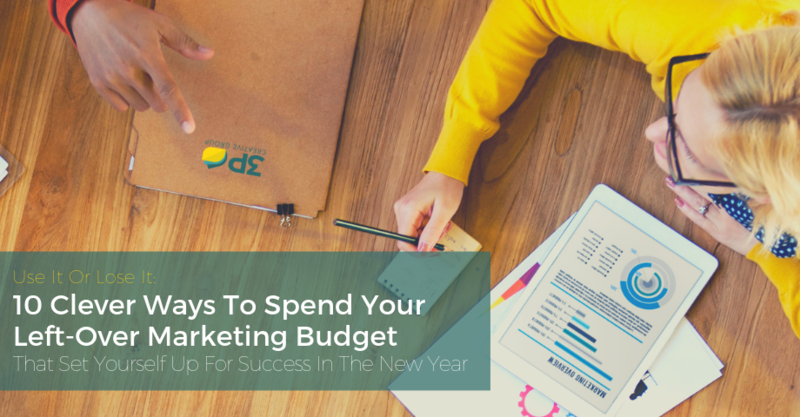 If you are like most marketers, you probably love creating infographics, whitepapers, and social media posts on Facebook, Twitter, and LinkedIn! Well, then our next point might be a bit of a tough pill to swallow! 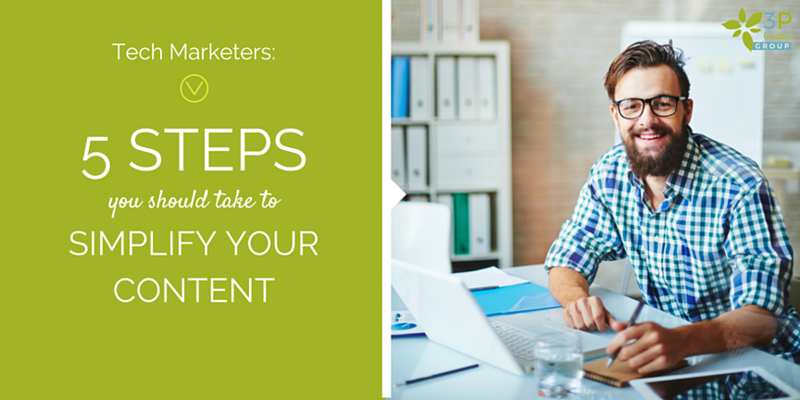 The thing is you are probably not creating the kind of content your prospects are looking for! As software and technology solutions become more feature rich, and leverage complex algorithms or innovative high tech, most tech marketers focus on pretty, surface-scratching infographics or whitepapers because they feel that explaining the product in detail would be too overwhelming or long-winded. Yes, give me a minute and it will make sense. Marketers often struggle to walk the fine line between simplifying things so people "get it" while giving enough technical specs and product information that IT buyers demand - but they do not have to. 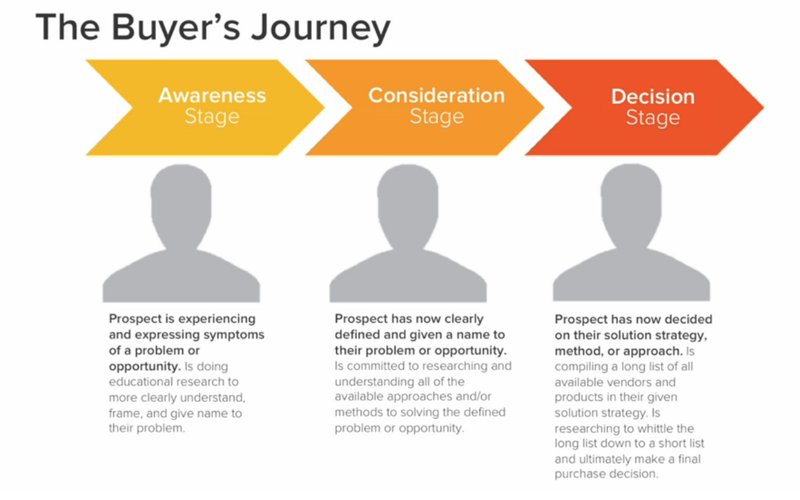 Instead, try to create content that matches in form and detail level the stage of the buyer's journey (see below) your prospect currently is in. When your prospects are just starting out in their research process, they are looking for general information that helps them solve a particular issue or explore an opportunity that is presenting itself. As they learn more, your prospects are increasingly looking for technical specs as well as detailed product and pricing (did I just hear you gasp?) information to enable them to make an informed purchasing decision. If there is one industry that loves its buzzwords, it is IT. I know it is so hard not to use them. When I still used to work at SAP, it was hard to have a business conversation in German if you were using words like Business Process Management and Service Oriented Architecture all the time! I ended up speaking 'English' half the time anyway, so what was the point, right? Now, of course, the buzzwords have changed. Now, we are talking about Artificial Intelligence, Internet of Things, Quantum Computing, Big Data and, of course, (still) Actionable Analytics. IT Buzzwords have their place since they were born out of the necessity to give complex scenarios or processes a name without having to try to describe them. But, in the recent years, IT websites or tech marketing material have almost become incomprehensible, if not unreadable. Instead of filling your website with endless strings of buzzwords (e.g., 'Standards-based, hot-pluggable infrastructure interoperates with your existing IT investments') use real language when talking about benefits. Use storytelling, visual aids, and snack-size bits of information to get your story across — which brings me to my next points. When I was a child, I had two passions: The outdoors and Legos. Legos are amazing little things because you can construct life-size Stormtroopers and even the Millenium Falcon with them, yet they are just simple blocks of plastic. Later on, when I spent days on end writing code, I imagined my little Java classes as Lego blocks, and it helped me visualize the result. I know, I am a nerd that way, but what I am trying to say is: breaking down complex information into easy to digest bites will help your readers better understand your technology, your product, or your innovative edge! Juriba's product, for example, enables IT project managers to better assess, ready, and migrate assets. And then subdivided them further into seven steps - as you can see in the graphic. Just make sure, that your visitor has an intuitive way of piecing back the bits together into one cohesive picture! 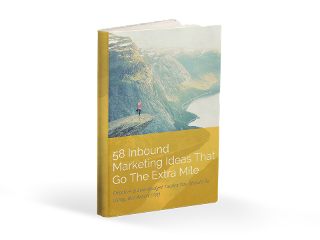 Storytelling and visual communication are two tactics in the inbound marketing box belt that are tremendously helpful - especially for tech marketers. Your prospects might forget all the product specs, but they will remember that story of that customer who chopped 30% of his software licenses and avoided a vendor audit by using your solution to consolidate software licenses. And everyone loves a good story, especially if what they are reading all day is very dry and often boring content. 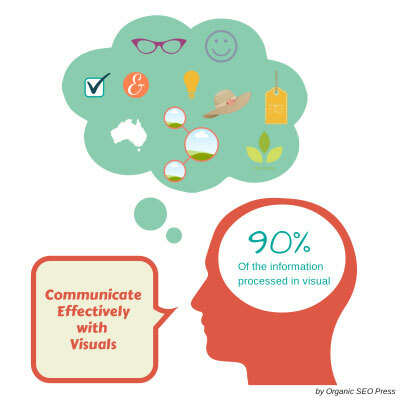 Another way to communicate more efficiently is by using visuals. Did you know that 90% of all the information processed is visual and that the human brain can process images 60,000x faster than written text? Well, that's a good thing then because the attention span of an internet-surfing adult is less than the attention span of a goldfish! So be aware, that you might have less than 9 seconds to get your reader's attention and the most effective way is by using relevant and high-quality imagery. IT buyers and tech marketers might not always see eye to eye, but inbound marketing can help marketers reach their audience more effectively if they actively listen what kind of information their prospects are looking for! Adjust the level of detail and the content format to what your visitor needs and use bite-size information, storytelling, and visual communication to help you break down complex scenarios and processes into easy-to-understand and memorable content.